When you mention modern boardgames to people who don’t play The Settlers of Catan, Ticket to Ride or any of the other thousands of games we call our hobby, then this is what 90% or more of them will think of. Admit it, you’ve heard that reply yourself when telling your non-gaming acquaintances about your hobby: “What, like Monopoly“? 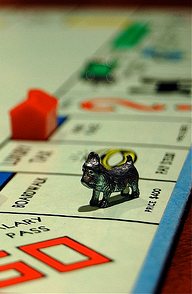 Monopoly is the iconic board game non-gamers think of when games are mentioned. 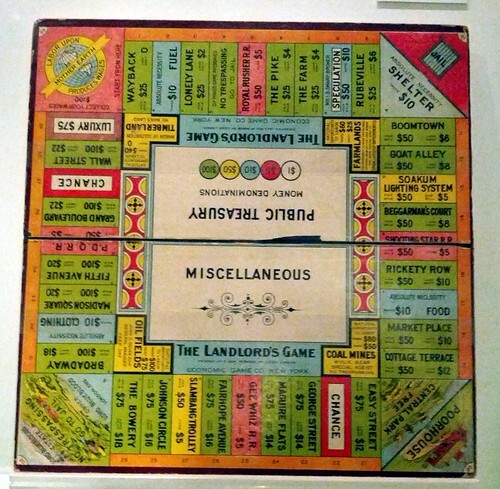 Despite not being the first modern boardgame – that title will arbitrarily be awarded to A Journey Through Europe from 1759 – it’s old enough that pretty much everyone alive today might remember it from their childhood: the first edition of The Landlord’s Game, Monopoly‘s predecessor, was published in 1906. Ironically, Elizabeth Phillips designed the game that was to become the all-time most commercially successful boardgame as a critique on capitalism, specifically private land monopolies. The self-published The Landlord’s Game became popular in large parts of the US and people created their own variants and rules adaptations, one of which was published from 1935 by Parker Brothers under the name Monopoly and credited to Charles Darrow, the man that was considered the sole inventor of Monopoly for the longest time. Today Monopoly is published by Hasbro who acquired Parker Brothers – with a chain or mergers and acquisition in-between – in 1991. The rules of the original game are quickly explained: taking turns, players roll two dice and move their game piece around the board. Landing on one of the 28 properties (2 utilities, 4 railway stations, 22 streets) gives that player first-buy privileges for that property at the price listed on the property card. If the player declines to buy, the property is auctioned and sold to the highest bidder. When landing on an already owned property you must pay rent to the owner as listed on the property card. Rent increases if the owner holds more properties of the same colour: streets come in sets of two or three, the four railway stations are considered of the same colour as well. Having a full set of streets lets the owner develop them, building houses and hotels on them to further increase the rent. Players can mortgage properties when in need of some quick cash and can also owe money to other players, but failing to repay your debts eliminates you from the game. That is also the only way to victory in the original rules Monopoly rules: be the last player left. 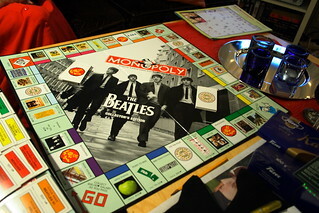 Since that leads to unpopularly long games – the longest Monopoly ever played according to Hasbro took about 10 weeks – optional rules for shorter games were added early on, most frequently in the form of a time limit. So, if the boardgame crowd is generally unhappy with Monopoly, how come it’s so iconic for the hobby? One reason, probably the biggest reason, is the games vast presence all over the world. Parker Brothers and their successors made great use of it’s popularity when there was little competition and spread the game wide and far, with more variants than any other game, possibly including Chess and all its siblings and historic variants. There isn’t a country in the world, nor a city with more than two phone-booths, that doesn’t have its own Monopoly variant. Take, for example, Monopoly: Reading, set in an English town with roughly 150.000 inhabitants or Monopoly: Aachen, for the German city near the Dutch border. No offense meant to either community, of course, I nearly picked them as two examples. The point is, there are hundreds of cities of their size around the world, and most of them have their own Monopoly. And it doesn’t end there, either. Movie franchises have their own editions of Monopoly, for instance Monopoly: The Lord of the Rings Trilogy Edition or the multiple Monopoly: Star Wars games. Cartoon series have Monopoly editions, football teams (both American and proper) have Monopoly editions. Even cosmetics stores have their own Monopoly editions (Monopoly: Sephora). Searching for Monopoly on Boardgamegeek finds close to 800 games, and that’s not counting games that are Monopoly in all but title, like Global: The Game. So if your local game store doesn’t carry at least five different editions of Monopoly, they are either a very small store, or they are, like me, wondering who buys all those editions of the same game. Most Monopoly variants can not even be considered variants but mere rethemings: the rules are the same, only the design and property names change. Or even worse, they include gadgets to make the game more tedious: Monopoly: Electronic Banking does away with paper money and runs all transactions through an electronic debit card device. But some true variants have appeared, especially more recently, and created new game experiences on the aging Monopoly foundation. Monopoly City (2009) is one such example that, while staying true to the original idea, removes the requirement to have a set before you may develop a property and adds decisions which way to develop, giving you a choice between residential and industrial properties, each with its own up- and downsides. And now you know about Monopoly. Got something you would like to see on the Meeplepedia? Drop us a line and we’ll place some workers on the research action.